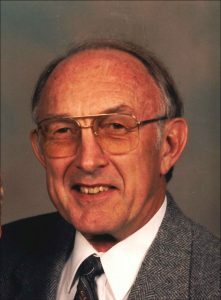 Mass of Christian Burial Friday, April 13, 2018, 10:30 A.M.
Visitation Thursday 4-7 P.M. KC and Parish Rosary 7 P.M.
Leon Joseph Schutte, 79, of Lincoln, NE, formerly of Schuyler, passed away 4/7/2018, at Gateway Vista in Lincoln. He was born to George and Eleanor (Brockman) Schutte on 9/13/1938, in Lawrence, NE. He graduated from Clarks High School where he played football, basketball and ran track. He held school records in the 440 and mile relay for over 20 years. He got 2nd in the state track meet in the 440. He also played Junior Legion baseball. He then attended the University of Nebraska-Lincoln. Leon is a Veteran of the US Air Force. He married Ardith K. Anderson on 9/2/1961, in Clarks, NE. He spent his career working as a computer programmer and data processing manager at Mutual of Omaha, University of Omaha, Wagner Mills in Schuyler, and the Benedictine Mission Home in Schuyler. Leon and Ardith were long time members at St Augustine’s Catholic Church in Schuyler where Leon served as Eucharistic Minister and sang in the choir. Leon was past Grand Knight of Schuyler Council 2716, Faithful Navigator of Fourth Degree JFK Assembly, and Nebraska State Church Director. The Knights awarded Leon with Knight of the year in 1994, and later the Schutte’s were awarded Family of the Year. Leon was a member of the American Legion and the Fraternal Order of Eagles. He enjoyed hunting, fishing, camping, boating and snow skiing with family and friends. Leon is survived by his wife, Ardith of 56 years, son James (Sarina) Schutte of Glen Ellyn, IL, grandchildren Nicole, Tyler and Samantha, all of Glen Ellyn, IL, daughter Deborah (Kevin) Schutte Ullmann of Fort Worth, TX, grandsons Hayden and Brandon of Fort Worth, TX, brother Gerald (Carol) Schutte of Omaha, sister Kathleen (William) Adasiewicz of Redwood City, CA, and many nieces, nephews, aunts and uncles. He was preceded in death by his parents.